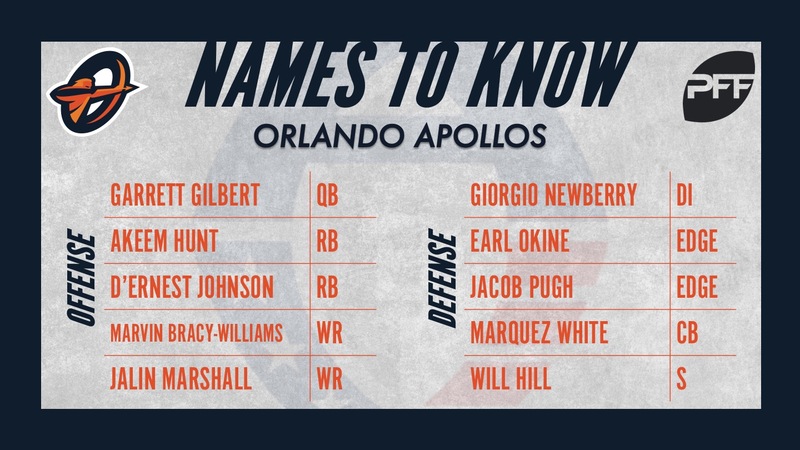 We continue the list today with the Orlando Apollos, head coached by Steve Spurrier. Gilbert won the starting gig in Orlando on the heels of an impressive training camp and an impressive pedigree. Long has passed since his days at the University of Texas and as a 5-star high school football player but Gilbert’s still shown that he has the tools to live up to that billing. He enters Week 1 as the Apollos starting quarterback after having the most recent NFL regular season action of any AAF player when he suited up for the Carolina Panthers in Week 17 against the New Orleans Saints. While he has 46 NFL regular season carries to his name, Hunt’s presence in the backfield is more than just a ball carrier. In three seasons in the NFL, he hauled in 75% of his targeted passes and racked up more yards after the catch than total receiving yards proving he’s a threat with the ball in his hands in space. Similarly to Hunt, Johnson was dominant with the ball in his hands during his tenure at USF. Over his four years of grades with the Bulls, Johnson racked up a ridiculous 1,823 rushing yards and 886 receiving yards. Impressively enough, 599 of his career receiving yards came after the catch and 1,075 of his rushing yards came after contact. He’s a tough guy to bring down in the open field and should complement Hunt’s skill set in the backfield. One of, if not THE, fastest man in all of professional football, Bracy-Williams was a member of the U.S. Olympic sprinting team in 2016 after starring at Florida State. He saw all of three targets in his time in NFL training camps but he can no doubt still fly. If he gets past his defender, look out, as there is likely not a member of any defense that can catch him. With a similar build to Bracy-Williams, Marshall feasted in the slot during his time at Ohio State and with the New York Jets in 2016. Over the two seasons in which we have grades from him with the Buckeyes, he recorded a total of 974 receiving yards, 577 of which came after the catch. He averaged a whopping 9.3 YAC/reception during the 2014 season with OSU. With their taller receivers occupying the outside and Bracy-Williams requiring attention, Marshall could thrive on the inside for the Apollos. Over the course of his final season at Florida State, Newberry turned it on and was more than just a pass-rushing menace. He was a sure tackler, finishing the season with 19 total tackles without a miss while he also put up above-average grades in run defense. He’s penciled in to start at one of the defensive end spots in Orlando’s base 3-4 scheme so look for his versatility to bode well for him. A mountain of a man, Okine absolutely dominated during the first outing for the Apollos, finishing with the highest game grade during the AAF’s opening set of scrimmage games. His 99.5 overall grade sums up the potential he has. Standing at 6-foot-7, 264 pounds, Okine is a big guy with a big motor and should have his name called early and often this season. Pugh looks penciled in at the other outside linebacker spot as he brings a pass-rushing skill set with his sideline-to-sideline ability. He racked up 53 total QB pressures on just 479 career pass-rushes at Florida State while he also missed just 10 of 100 total tackle attempts. At 6-foot-4, 229 pounds, it’s hard to consider him the smaller of this duo at OLB, but he and Okine should command opposing offensive coordinator’s attention. Yes, another former FSU standout, this time in the secondary as White joined the Apollos after impressing for two preseasons with the Dallas Cowboys. With the Seminoles, he finished three years of grading with plus-grades in coverage each year and a career passer rating when targeted of 60.2. Look, Hill may not start in Orlando but he brings with him one of the more experienced backgrounds of NFL regular season action in the entire league. On 2,636 career snaps with the New York Giants and Baltimore Ravens, Hill finished each season of his NFL career with plus-grades and 11 career plays on the ball (4 INT, 7 PBU). His veteran leadership should pay large dividends to the rest of that secondary while he still showcased enough ability at only 28 years old to grab a final roster spot.